This post was written for Marathon Tours and Travel. One size doesn’t fit all when it comes to long-distance runners’ motivations. The reasons we run vary as widely as our body shapes and personality types. There are the Seven Continent Club members, the Abbott World Marathon Major doers, the Runner’s Country Club enthusiasts, the elites, the speedsters, the BQers, the enjoyers, the maniacs, the charity raisers, those who run for new a PR/bling/dessert/stress relief/in memorandum/to prove they can/who lost a bet, and the list goes on. The great thing about our sport is that there’s space for all. The bad news is that the largest races don’t necessarily agree. 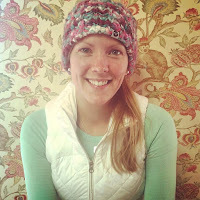 I fall somewhere between a Runner’s Country Club enthusiast and a marathon enjoyer -- one of my greatest motivators is packing my bags and traveling to see 26.2 miles of a new place on foot. I’ve run 3 dozen marathons and ultramarathons in places as close as my local trails in San Francisco, as quiet as the rainy streets of Reykjavik, and as remote as the islands of Antarctica. I’ve even checked an Abbott World Marathon Major and a BQ off my list when I qualified for the Boston Marathon in Chicago. And yet running on varied terrain at different paces around the world left me unexpectant of what I was to experience at my most recent international race. What I found was a race that made room for everyone on a joyous weekend of celebrating a storied city. A race that said one size can fit all. 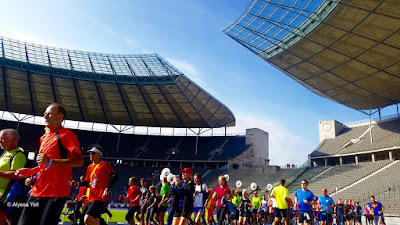 That race was the BMW BERLIN-MARATHON. Marathon weekend began on a high note: A Saturday morning breakfast run from the Charlottenburg Palace wound its way through the old Westend neighborhood and finished with a victory lap in the 1936 Olympic Stadium, where Jesse Owens forever changed the sport of running. 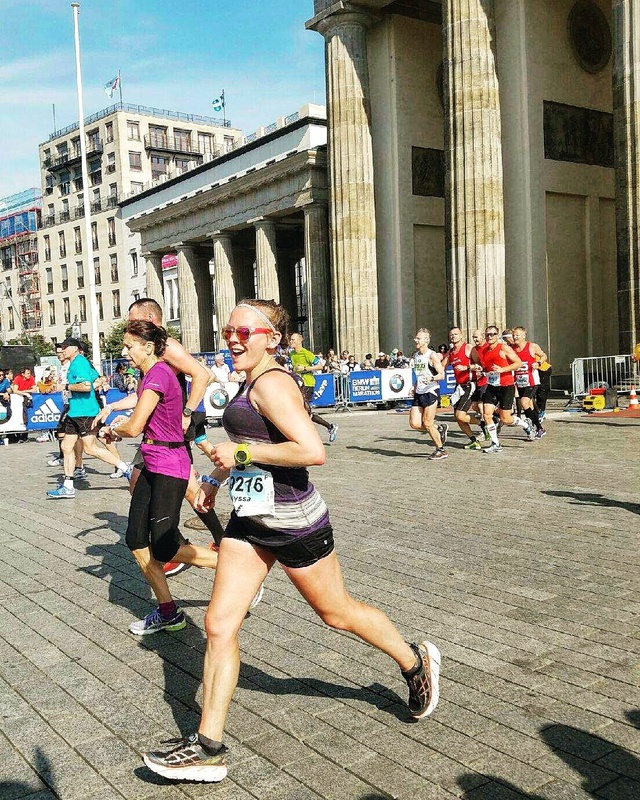 That note kept ringing loudly when a mini-marathon (4.2 kilometer) footrace and an inline skating marathon screamed through the streets of downtown Berlin in the evening, inviting everyone to glance at a course that welcomed different activities and all abilities. Then there was the marathon. The energy in Berlin was palpable as hoards of individuals from around the world marched toward the great Reichstag lawn -- the front yard of Germany’s Parliament during the late 19th century. This expanse of grass acted as a meeting spot for friends; allowed runners an area to stretch; and offered efficient signage for drop bags, port-o-potties, a warm-up area, and the walk into the lush Tiergarten to find our starting corrals. As we lined up on Straße des 17 Juni, it was impossible to miss all the shirts representing various countries and hear countless languages being spoken. 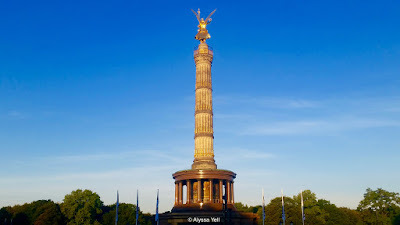 Even though we weren’t from the same area and we didn’t talk in the same tongue, the expanse of heads gazing toward Siegessäule, Germany’s victory tower, focused on the same goal. The marathon itself winds through 10 neighborhoods filled with jagged spires, old cathedrals, gothic architecture, patina statues, tree-lined streets, and a million cheering faces. 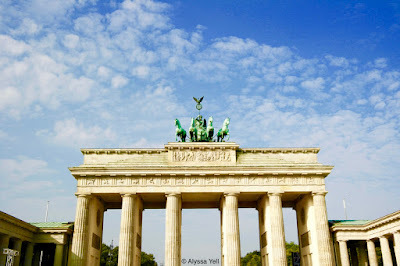 History buffs can’t ignore passing through Potsdamer Platz (a former gate on the Berlin Wall), the Berliner Dom, the Symphonic Konzerthaus, the German Chancellery, and an emotional finish through the Brandenburg Gate. 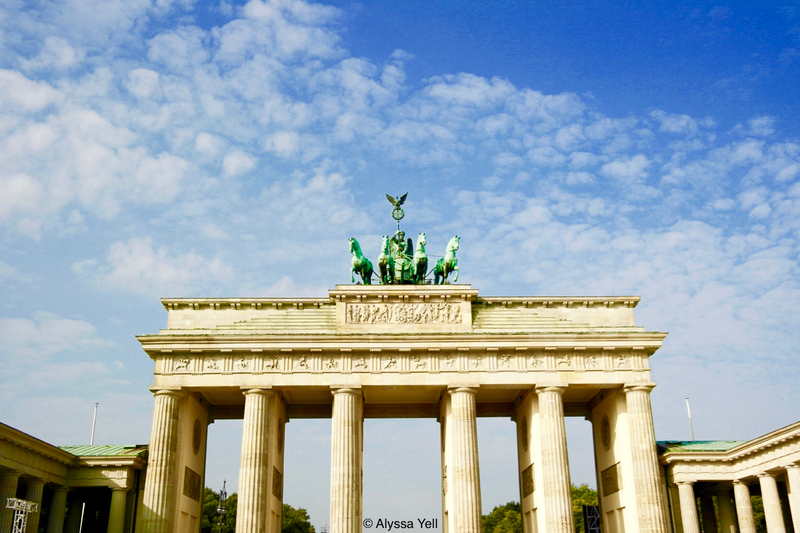 There’s no shortness of creativity bursting from Berlin’s seams, from artists to architects to designers to chefs to musicians. In true form, each block had no less than one band playing. I’m not talking commissioned bands performing in a quiet corner of a race -- I’m talking corner after corner of folk bands, punk bands, boy’s choirs, marching bands, mini orchestras, jazz bands, solo trumpets, solo drums, solo accordions, solo alpenhorns, and of course the beautiful song of human voices cheering on their loved ones. The audio presence of the race was enough to amp anyone up. The BMW BERLIN-MARATHON is the third largest marathon in the world, and it earns every bit of its deserved fame. Unlike other large marathons, anyone can run it. You don’t have to run a qualifying time to enter and you don’t have to be fast to toe the start line, even though this course attracts the fastest runners year after year. It’s one of the only races where you can run with the greatest athletes in the world, sightsee your way through hundreds of years of history, watch world records being set, and join your fellow friends in a celebration of unity and peace. 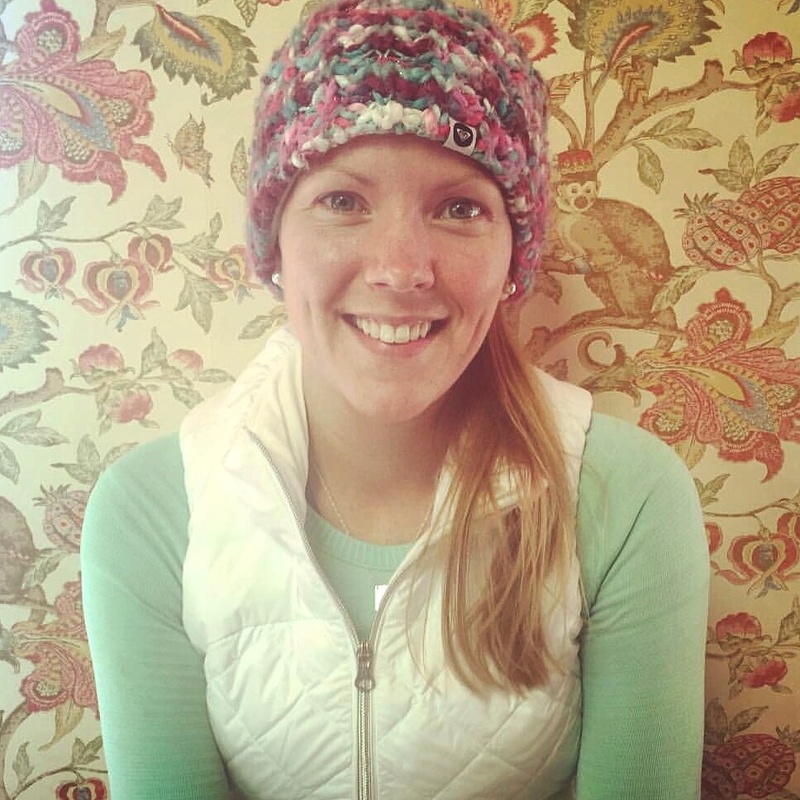 Alyssa Yell is an avid ultramarathoner, adventure enthusiast, & lady of athleisure. When punching the clock, she plays with words & fights with grammar.